A novel process for dyeing human keratin fibers in the presence of an oxidizing agent, comprising applying to the fibers at least one anhydrous composition (A) comprising at least one fatty substance, at least one organic amine having a pKb less than 12 at 25° C., and at least one surfactant, at least one composition (B) comprising at least one oxidizing agent, and at least one composition (C) comprising at least one dye chosen from oxidation dyes and direct dyes; a multi-compartment device or kit, wherein at least one first compartment comprises the at least one anhydrous cosmetic composition (A), at least one second compartment comprises at least one composition (B), and at least one third compartment comprises at least one composition (C); and a ready-to-use composition for dyeing human keratin fibers, comprising at least 35% by weight of at least one fatty substance, at least one organic amine having a pKb less than 12 at 25° C., at least one surfactant, at least one dye chosen from oxidation dyes and direct dyes, and at least one oxidizing agent. This application claims benefit of U.S. Provisional Application No. 61/006,483, filed Jan. 16, 2008, the contents of which are incorporated herein by reference. This application also claims benefit of priority under 35 U.S.C. § 119 to French Patent Application No. FR 0760277, filed Dec. 21, 2007, the contents of which are also incorporated herein by reference. Disclosed herein is a process for dyeing human keratin fibers in the presence of at least one oxidizing agent, comprising the use of: at least one anhydrous composition (A) comprising at least one fatty substance, at least one organic amine having a pKb less than 12 at 25° C., and at least one surfactant, at least one oxidizing composition (B), and at least one composition (C) comprising at least one dye. Also disclosed herein is a multi-compartment device or kit, comprising at least one first compartment containing the abovementioned at least one anhydrous composition (A), at least one second compartment comprising the at least one oxidizing composition (B), and at least one third compartment comprising the at least one composition (C) comprising at least one dye. Still further disclosed herein is a ready-to-use composition for dyeing human keratin fibers, comprising at least 35% by weight of at least one abovementioned fatty substance, at least one abovementioned organic amine, at least one above-mentioned surfactant, at least one abovementioned dye, and at least one abovementioned oxidizing agent. Among the methods for dyeing human keratin fibers, such as the hair, non-limiting mention may be made of oxidation dyeing or permanent dyeing. For example, those dyeing methods use at least one oxidation dye precursor, and usually at least one oxidation base optionally combined with at least one coupler. In general, oxidation bases can be chosen from ortho- or para-phenylenediamines, ortho- or para-aminophenols, and heterocyclic compounds. These oxidation bases are colorless or weakly colored compounds, which, when combined with oxidizing products, can give access to colored species via a process of oxidative condensation. The shades obtained with these oxidation bases are often varied by combining them with at least one coupler, these couplers being chosen, for example, from aromatic meta-diamines, meta-aminophenols, meta-diphenols, and certain heterocyclic compounds, such as indole compounds. The variety of molecules used as oxidation bases and couplers can allow a wide range of colors to be obtained. Direct dyeing or semi-permanent dyeing is also known. The process conventionally used in direct dyeing involves applying to the keratin fibers direct dyes, which are colored and coloring molecules that have affinity for the fibers, leaving them on for a time to allow the molecules to penetrate, by diffusion, into the fiber, and in rinsing them off. The direct dyes frequently used are, for example, chosen from nitrobenzene, anthraquinone, nitropyridine, azo, methine, azomethine, xanthene, acridine, azine, and triarylmethane direct dyes. This type of process does not generally involve the use of an oxidizing agent to develop the coloration. However, it is possible to use one in order to obtain, along with the coloration, a lightening effect. Such a process is then referred to as direct dyeing or semi-permanent dyeing under lightening conditions. Processes of permanent or semi-permanent dyeing under lightening conditions thus may involve using, for example, along with the dye composition, an aqueous composition comprising at least one oxidizing agent, under alkaline pH conditions in the majority of cases. This at least one oxidizing agent can degrade the melanin of the hair, which, depending on the nature of the oxidizing agent present, may lead to a more or less pronounced lightening of the fibers. Thus, for relatively weak lightening, the at least one oxidizing agent may be, for example, hydrogen peroxide. When more substantial lightening is desired, peroxygenated salts, such as persulfates, may be used in the presence of hydrogen peroxide. At least one difficulty may arise from the fact that these processes are often performed under alkaline conditions and that the alkaline agent most commonly used is aqueous ammonia. Aqueous ammonia is frequently used in processes of this type. The reason for this is that it may allow the pH of the composition to be adjusted to an alkaline pH to enable activation of the oxidizing agent. In addition, this agent may also cause swelling of the keratin fiber, with opening of the scales, which can promote the penetration of the oxidizing agent, and also of the dyes, for example the oxidation dyes, into the fiber, and thus can increase the efficacy of the dyeing reaction. Furthermore, the amount of ammonia given off may require the use of higher amounts than necessary in order to compensate for this loss. This may affect the user, who not only may remain inconvenienced by the odor, but may also be confronted with greater risks of intolerance, for instance irritation of the scalp, such as stinging. The option of replacing all or at least some of the aqueous ammonia with at least one other standard basifying agent frequently does not lead to compositions that can be as efficient as those based on aqueous ammonia, for example, since those basifying agents do not always afford sufficient lightening of pigmented fibers in the presence of an oxidizing agent. Thus, there is a need in the art for dyeing processes performed in the presence of at least one oxidizing agent, which do not have at least one of the drawbacks of those associated with existing processes, due to the presence of large amounts of aqueous ammonia, while at the same time maintaining at least some of the efficiency, with respect to the dyeing power obtained, the chromaticity and the homogeneity of the coloration along the fiber. For instance, the process according to the present disclosure leads to strong colorations that can allow gray hair to be covered. at least one composition (C) comprising at least one dye chosen from oxidation dyes and direct dyes. The present disclosure also relates to a multi-compartment device or kit comprising at least one first compartment containing at least one anhydrous composition (A) comprising at least one fatty substance, at least one organic amine having a pKb less than 12 at 25° C., and at least one surfactant, at least one second compartment containing at least one composition (B) comprising at least one oxidizing agent, and at least one third compartment containing at least one composition (C) comprising at least one dye chosen from oxidation dyes and direct dyes. The present disclosure further relates to a ready-to-use composition for dyeing human keratin fibers, comprising at least 35% by weight of at least one fatty substance, at least one organic amine having a pKb less than 12 at 25° C., at least one surfactant, at least one dye chosen from oxidation dyes and direct dyes, and at least one oxidizing agent. The dyeing process may be performed, for example, in the presence of an anhydrous composition (A). As used herein, the term “anhydrous composition” means a composition with a water content of less than 5% by weight, for example less than or equal to 2% by weight, such as less than or equal to 1% by weight relative to the weight of the composition. The water may, for example, be in the form of bound water, such as the water of crystallization of salts, or traces of water absorbed by the starting materials used in the preparation of the compositions according to the present disclosure. As used herein, the term “fatty substance” means an organic compound that is insoluble in water at ordinary temperature (25° C.) and at atmospheric pressure (760 mmHg) (solubility of less than 5%, for example less than 1% and further for example less than 0.1%). In addition, the at least one fatty substance is soluble in organic solvents under the same temperature and pressure conditions, for instance chloroform, ethanol, or benzene. By way of non-limiting example, the at least one fatty substance can be chosen from alkanes, fatty alcohols, fatty acids, fatty acid esters, fatty alcohol esters, mineral oils, plant oils, animal oils, synthetic oils, silicones, and waxes. For the purposes of the present disclosure, the fatty alcohols, fatty esters, and fatty acids may comprise at least group chosen from linear and branched, saturated and unsaturated hydrocarbon-based groups comprising 6 to 30 carbon atoms, optionally substituted, for example, with at least one hydroxyl group (for example 1 to 4). If they are unsaturated, these compounds may comprise one to three conjugated or nonconjugated carbon-carbon double bonds. As regards alkanes, these alkanes, comprising from 6 to 30 carbon atoms, can be linear. Non-limiting mention may be made of hexane and dodecane. partially hydrocarbon-based and/or silicone-based fluoro oils, for instance those described in Japan Patent Application No. JP-A-2-295 912; fluoro oils that may also be mentioned by way of non-limiting example include perfluoromethylcyclopentane and perfluoro-1,3-dimethylcyclohexane, sold under the names FLUTEC® PC1 and FLUTEC® PC3 by the company BNFL Fluorochemicals; perfluoro-1,2-dimethylcyclobutane; perfluoroalkanes such as dodecafluoropentane and tetradecafluorohexane, sold under the names PF 5050® and PF 5060® by the company 3M, or bromoperfluorooctyl sold under the name FORALKYL® by the company Atochem; nonafluoromethoxybutane and nonafluoroethoxyisobutane; perfluoromorpholine derivatives such as 4-trifluoromethyl perfluoromorpholine sold under the name PF 5052® by the company 3M. The at least one wax can, by way of non-limiting example, be chosen from carnauba wax, candelilla wax, esparto grass wax, paraffin wax, ozokerites, plant waxes such as olive wax, rice wax, hydrogenated jojoba wax, and or the absolute waxes of flowers such as the essential wax of blackcurrant blossom sold by the company Bertin (France), animal waxes, for instance beeswaxes and modified beeswaxes (cerabellina); other waxes or waxy starting materials that may be used according to the present disclosure include marine waxes such as the product sold by the company Sophim under the reference M82, and polyethylene waxes, and polyolefin waxes in general. The at least one fatty acid may, by way of non-limiting example, be saturated or unsaturated and comprise from 6 to 30 carbon atoms, for example from 9 to 30 carbon atoms. Further by way of non-limiting example, the at least one fatty acid can be chosen from myristic acid, palmitic acid, stearic acid, behenic acid, oleic acid, linoleic acid, linolenic acid, and isostearic acid. The esters are chosen from esters of saturated and unsaturated, linear and branched C1-C26 aliphatic mono- and polyacids and of saturated and unsaturated, linear and branched C1-C26 aliphatic mono- and polyalcohols, the total carbon number of the esters being greater than or equal to 10. Among the monoesters, non-limiting mention may be made of dihydroabietyl behenate; octyldodecyl behenate; isocetyl behenate; cetyl lactate; C12-C15 alkyl lactate; isostearyl lactate; lauryl lactate; linoleyl lactate; oleyl lactate; (iso)stearyl octanoate; isocetyl octanoate; octyl octanoate; cetyl octanoate; decyl oleate; isocetyl isostearate; isocetyl laurate; isocetyl stearate; isodecyl octanoate; isodecyl oleate; isononyl isononanoate; isostearyl palmitate; methylacetyl ricinoleate; myristyl stearate; octyl isononanoate; 2-ethylhexyl isononate; octyl palmitate; octyl pelargonate; octyl stearate; octyldodecyl erucate; oleyl erucate; ethyl and isopropyl palmitates, 2-ethylhexyl palmitate, 2-octyldecyl palmitate, alkyl myristates such as isopropyl, butyl, cetyl, 2-octyldodecyl, myristyl, or stearyl myristate, hexyl stearate, butyl stearate, isobutyl stearate; dioctyl malate, hexyl laurate, and 2-hexyldecyl laurate. By way of further non-limiting example, esters chosen from esters of C4-C22 dicarboxylic and tricarboxylic acids, esters of C1-C22 alcohols esters of mono-, di-, and tricarboxylic acids and esters of C2-C26 di-, tri-, tetra-, and pentahydroxy alcohols may also be used. Non-limiting mention of the following may also be made: diethyl sebacate; diisopropyl sebacate; diisopropyl adipate; di-n-propyl adipate; dioctyl adipate; diisostearyl adipate; dioctyl maleate; glyceryl undecylenate; octyldodecyl stearoyl stearate; pentaerythrityl monoricinoleate; pentaerythrityl tetraisononanoate; pentaerythrityl tetrapelargonate; pentaerythrityl tetraisostearate; pentaerythrityl tetraoctanoate; propylene glycol dicaprylate; propylene glycol dicaprate; tridecyl erucate; triisopropyl citrate; triisostearyl citrate; glyceryl trilactate; glyceryl trioctanoate; trioctyldodecyl citrate; trioleyl citrate; propylene glycol dioctanoate; neopentyl glycol diheptanoate; diethylene glycol diisononanoate; and polyethylene glycol distearates. Further among the esters that may be used in the at least one anhydrous composition (A) according to the present disclosure, non-limiting mention may be made of ethyl, isopropyl, myristyl, cetyl, or stearyl palmitate, 2-ethylhexyl palmitate, 2-octyldecyl palmitate, alkyl myristates such as isopropyl, butyl, cetyl, or 2-octyldodecyl myristate, hexyl stearate, butyl stearate, isobutyl stearate, dioctyl malate, hexyl laurate, 2-hexyldecyl laurate, isononyl isononanoate, or cetyl octanoate. Non-limiting examples of suitable sugars that may be mentioned include sucrose (or saccharose), glucose, galactose, ribose, fructose, maltose, mannose, arabinose, xylose and lactose, and derivatives thereof, for example alkyl derivatives, such as methyl derivatives, for instance methylglucose. For example, the sugar esters of fatty acids may be chosen from esters or mixtures of esters of sugars described previously and of linear and branched, saturated and unsaturated C6-C30, for example C12-C22 fatty acids. If they are unsaturated, these compounds may comprise one to three conjugated or nonconjugated carbon-carbon double bonds. These esters may be chosen, by way of non-limiting example, from oleates, laurates, palmitates, myristates, behenates, cocoates, stearates, linoleates, linolenates, caprates, and arachidonates, and mixtures thereof such as, oleo-palmitate, oleo-stearate, and palmito-stearate mixed esters. In at least one embodiment, monoesters or diesters are used, for instance sucrose, glucose, and methylglucose, mono- or dioleates, stearates, behenates, oleopalmitates, linoleates, linolenates, and oleostearates. Non-limiting mention may be made of the product sold under the name GLUCATE® DO by the company Amerchol, which is a methylglucose dioleate. The silicones that may be used in the at least one anhydrous composition (A) of the present disclosure include volatile, nonvolatile, cyclic, linear, and branched silicones, which are unmodified or modified with organic groups, having a viscosity ranging from 5×10−6 to 2.5 m2/s at 25° C., for example ranging from 1×10−5 to 1 m2/s. The silicones that may be used in accordance with the present disclosure may, by way of non-limiting example, be in the form of oils, waxes, resins, and gums. By way of further non-limiting example, the at least one silicone may be chosen from polydialkylsiloxanes, for example polydimethylsiloxanes (PDMS), and organomodified polysiloxanes comprising at least one functional group chosen from poly(oxyalkylene) groups, amino groups, and alkoxy groups. The organopolysiloxanes are defined in greater detail in Walter Noll's “Chemistry and Technology of Silicones” (1968) Academic Press. They can be volatile or nonvolatile. (i) cyclic polydialkylsiloxanes comprising from 3 to 7 silicon atoms, for example from 4 to 5 silicon atoms. These are, for example, octamethylcyclotetrasiloxane sold further for example under the name VOLATILE SILICONE® 7207 by Union Carbide or SILBIONE® 70045 V 2 by Rhodia, decamethylcyclopentasiloxane sold under the name VOLATILE SILICONE® 7158 by Union Carbide, and SILBIONE® 70045 V 5 by Rhodia, and mixtures thereof. (ii) linear volatile polydialkylsiloxanes comprising 2 to 9 silicon atoms and having a viscosity of less than or equal to 5×10−6 m2/s at 25° C. A non-limiting example is decamethyltetrasiloxane sold, for example under the name SH 200 by the company Toray Silicone. Silicones belonging to this category are also described in the article published in Cosmetics and Toiletries, Vol. 91, Jan. 76, pp. 27-32, Todd & Byers “Volatile Silicone Fluids for Cosmetics”. By way of non-limiting example, nonvolatile polydialkylsiloxanes, polydialkylsiloxane gums and resins, polyorganosiloxanes modified with organofunctional groups above, and mixtures thereof, may be used in the at least one anhydrous composition (A) according to the present disclosure. By way of further non-limiting example, polydialkylsiloxanes, including polydimethylsiloxanes comprising trimethylsilyl end groups may be used. Non-limiting mention may also be made of polydimethylsiloxanes comprising dimethylsilanol end groups known under the name Dimethiconol (CTFA), such as the oils of the 48 series from the company Rhodia. The silicone gums that can be used in the at least one anhydrous composition (A) in accordance with the present disclosure may, by way of non-limiting example, be polydialkylsiloxanes, for example polydimethylsiloxanes with high number-average molecular masses ranging from 200,000 to 1,000,000, used alone or as a mixture in a solvent. This solvent may, by way of non-limiting example, be chosen from volatile silicones, polydimethylsiloxane (PDMS) oils, polyphenylmethylsiloxane (PPMS) oils, isoparaffins, polyisobutylenes, methylene chloride, pentane, dodecane, and tridecane, and mixtures thereof. mixtures of two PDMSs with different viscosities, for example a PDMS gum and a PDMS oil, such as the product SF 1236 from the company General Electric. The product SF 1236 is a mixture of an SE 30 gum defined above, having a viscosity of 20 m2/s, and an SF 96 oil, with a viscosity of 5×10−6 m2/s. This product, for example, comprises 15% SE 30 gum and 85% SF 96 oil. wherein R is independently chosen from a hydrocarbon-based group comprising 1 to 16 carbon atoms. For example R may be a C1-C4 lower alkyl radical, for example methyl. Among these resins, non-limiting mention may be made of the product sold under the name DOW CORNING 593 and those sold under the names SILICONE FLUID SS 4230 and SS 4267 by the company General Electric, which are silicones of dimethyl/trimethyl siloxane structure. Non-limiting mention may also be made of the trimethyl siloxysilicate type resins sold, for example, under the names X22-4914, X21-5034, and X21-5037 by the company Shin-Etsu. The organomodified silicones that can be used in accordance with the present disclosure may, by way of non-limiting example, be silicones as defined above and comprising in their structure at least one organofunctional group attached via a hydrocarbon-based radical. Besides the silicones described above, the organomodified silicones may, by way of non-limiting example, be polydiarylsiloxanes, for example polydiphenylsiloxanes, and polyalkylarylsiloxanes functionalized with the at least one organofunctional group mentioned previously. The polyalkylarylsiloxanes may be chosen, for example, from linear and branched polydimethyl/methylphenylsiloxanes and polydimethyl/diphenylsiloxanes with a viscosity ranging from 1×10−5 to 5×10−2 m2/s at 25° C.
certain oils of the SF series from General Electric, such as SF 1023, SF 1 154, SF 1250, and SF 1265. For example, the at least one fatty substance may be a compound that is liquid at a temperature of 25° C. and at atmospheric pressure. In at least one embodiment, the at least one fatty substance may be chosen from liquid petroleum jelly, polydecenes, and liquid esters, and mixtures thereof. The at least one anhydrous composition (A) has at least one fatty substance present in an amount ranging from 10% to 99% by weight, for example ranging from 20% to 90% by weight, such as ranging from 25% to 80% by weight, relative to the weight of the at least one anhydrous composition (A). The at least one anhydrous composition (A) may also comprise at least one organic amine having a pKb less than 12 at 25° C., for example less than 10, such as less than 6. The pKb corresponds to the function of highest basicity. In at least one embodiment of the present disclosure, the at least one organic amine is at least partially miscible with the at least one fatty substance, at room temperature and atmospheric pressure. For example, the at least one organic amine is totally soluble at a temperature of 25° C. and at atmospheric pressure (760 mmHg) in the at least one fatty substance. For example, the at least one fatty substance and the at least one organic amine form a single phase at 25° C. and at atmospheric pressure. According to at least one embodiment of the present disclosure, the at least one organic amine comprises one or two functional groups chosen from primary, secondary, and tertiary amine functional groups, and at least one group chosen from linear and branched C1-C8 alkyl groups bearing at least one hydroxyl radical. Non-limiting examples of the at least one organic amine may be alkanolamines such as mono-, di-, or trialkanolamines, comprising at least one identical or different C1-C4 hydroxyalkyl radicals. Among the compounds of this type non-limiting mention may be made of monoethanolamine, diethanolamine, triethanolamine, monoisopropanolamine, diisopropanolamine, N-dimethylaminoethanolamine, 2-amino-2-methyl-1-propanol, triiso-propanolamine, 2-amino-2-methyl-1,3-propanediol, 3-amino-1,2-propanediol, 3-dimethylamino-1,2-propanediol, and tris(hydroxymethylamino)methane. wherein W is chosen from C1-C6 alkylene residues optionally substituted with a hydroxyl group or a C1-C6 alkyl radical; Rx, Ry, Rz, and Rt, which may be identical or different, are chosen from a hydrogen atom and C1-C6 alkyl, C1-C6 hydroxyalkyl, and C1-C6 aminoalkyl radicals. According to at least one aspect of the present disclosure, the at least one organic amine is chosen from at least one amino acid. For example, the amino acids that may be used are of natural or synthetic origin, in L, D, or racemic form, and comprise at least one acid functional group chosen, for example, from carboxylic acid, sulfonic acid, phosphonic acid, and phosphoric acid functions. The at least one amino acid may be in its neutral or ionic form. For example, the at least one amino acid can be an amino acid comprising an additional amine functional group optionally included in a ring or in a ureido functional group. Non-limiting examples of the compounds corresponding to formula (I) include histidine, lysine, arginine, ornithine, and citrulline. The at least one amino acid that may be used in the present disclosure include, by way of non-limiting example, aspartic acid, glutamic acid, alanine, arginine, ornithine, citrulline, asparagine, carnitine, cysteine, glutamine, lysine, histidine, lysine, isoleucine, leucine, methionine, N-phenylalanine, proline, serine, taurine, threonine, tryptophan, tyrosine, and valine. In one aspect of the present disclosure, the at least one amino acid may be used as a mixture with at least one solid or pasty, for example pulverulent, adjuvant. The adjuvants may be chosen from clays, salts, anionic, nonionic, cationic, or zwitterionic surfactants, natural or synthetic thickeners, optionally modified starch, glass beads, silica, Nylon, alumina, titanium dioxide, zeolites, poly(methyl methacrylate) (PMMA), chitosan, maltodextrin, cyclodextrin, mono- or disaccharides, for instance glucose, sucrose, sorbitol, or fructose, zinc oxide, zirconium oxide, resin particles, for instance silicone or silica beads, talc, borosilicates, for example calcium borosilicate, polyethylene, cotton, polytetra-fluoroethylene (PTFE), cellulose and its derivatives, superabsorbent compounds, magnesium carbonate, calcium carbonate, corn seeds, polydimethylsiloxane gums, polyacrylamide, porous hydroxyapatite, silk, collagen, sawdust, wrack powder, crosslinked polyvinylpyrrolidone, calcium alginate, active charcoal, and poly(vinylidene chloride/acrylo-nitrile) particles, for example those sold under the general name EXPANCEL® by the company Akzo Nobel under the references EXPANCEL® WE, EXPANCEL® DE, and mixtures thereof. According to at least one aspect of the present disclosure, the at least one organic amine is chosen from at least one amino acid. Non-limiting examples of the at least one amino acid that may be used include arginine, lysine, and histidine, and mixtures thereof. According to at least one aspect of the present disclosure, the at least one organic amine can be chosen from at least one organic amine of heterocyclic type. Besides histidine that has already been mentioned in the amino acids, non-limiting mention may be made, for example, of pyridine, piperidine, imidazole, triazole, tetrazole, and benzimidazole. According to at least one aspect of the present disclosure, the at least one organic amine can be chosen from at least one amino acid dipeptide. As amino acid dipeptides that may be used in the present disclosure, non-limiting mention may be made, for example, of carnosine, anserine, and baleine. According to at least one aspect of the present disclosure, the at least one organic amine can be chosen from at least one compound comprising a guanidine functional group. As organic amines of this type that may be used in the present disclosure, besides arginine that has already been mentioned as an amino acid, non-limiting mention may be made of creatine, creatinine, 1,1-dimethylguanidine, 1,1-diethylguanidine, glycocyamine, metformin, agmatine, N-amidinoalanine, 3-guanidino-propionic acid, 4-guanidinobutyric acid, and 2-([amino(imino)methyl]amino)ethane-1-sulfonic acid. For example, the at least one organic amine present in the at least one anhydrous composition (A) can be an alkanolamine. For instance, the at least one organic amine can be chosen from 2-amino-2-methyl-1-propanol and monoethanolamine. For example, the at least one organic amine can be monoethanolamine. For example, the at least one anhydrous composition (A) has at least one organic amine present in an amount ranging from 0.1% to 40% by weight, for example from 0.5% to 20% by weight, relative to the weight of the composition. For example, the at least one surfactant can be chosen from nonionic surfactants and anionic surfactants. It should be noted that the alkyl or acyl radical of these various compounds can comprise from 6 to 24 carbon atoms, for example from 8 to 24 carbon atoms, and the aryl radical may, by way of non-limiting example, be chosen from phenyl and benzyl groups. The at least one nonionic surfactant can be chosen, by way of non-limiting example, from monooxyalkylenated, polyoxyalkylenated, monoglycerolated, and polyglycerolated nonionic surfactants. The oxyalkylene units can, by way of non-limiting example, be oxyethylene and oxypropylene units, and a combination thereof, for instance oxyethylene units. condensates of ethylene oxide and/or of propylene oxide, alone or as mixtures. The at least one surfactant comprises a number of moles of ethylene oxide and/or of propylene oxide ranging from 1 to 50, for example from 2 to 30. For example, the at least one nonionic surfactant may not comprise any oxypropylene units. In accordance with at least one aspect of the present disclosure, the at least one oxyalkylenated nonionic surfactant may, by way of non-limiting example, be chosen from oxyethylenated C8-C30 alcohols and oxyethylenated C8-C30 amines. As non-limiting examples of monoglycerolated and polyglycerolated nonionic surfactants, monoglycerolated and polyglycerolated C8-C40 alcohols can be used. wherein R is chosen from linear and branched C8-C40 alkyl and alkenyl radicals, for example C8-C30 alkyl and alkenyl radical, and m is an integer ranging from 1 to 30, for example from 1 to 10. As examples of compounds that are suitable in the context of the present disclosure, non-limiting mention may be made of lauryl alcohol comprising 4 mol of glycerol (INCI name: Polyglyceryl-4 Lauryl Ether), lauryl alcohol comprising 1.5 mol of glycerol, oleyl alcohol comprising 4 mol of glycerol (INCI name: Polyglyceryl-4 Oleyl Ether), oleyl alcohol comprising 2 mol of glycerol (INCI name: Polyglyceryl-2 Oleyl Ether), cetearyl alcohol comprising 2 mol of glycerol, cetearyl alcohol comprising 6 mol of glycerol, oleocetyl alcohol comprising 6 mol of glycerol, and octadecanol comprising 6 mol of glycerol. The alcohol can be a mixture of alcohols in the same way that the value of m is a statistical value, which means that, in a commercial product, several species of polyglycerolated fatty alcohol may coexist in the form of a mixture. Among the monoglycerolated and polyglycerolated alcohols, non-limiting examples include C8/C10 alcohol comprising 1 mol of glycerol, the C10/C12 alcohol comprising 1 mol of glycerol, and the C12 alcohol comprising 1.5 mol of glycerol. For example, the at least one surfactant present in the at least one anhydrous composition (A) can be a nonionic surfactant. The at least one surfactant may be present in the at least one anhydrous composition (A) in an amount ranging, for example, from 0.1% to 50% by weight, further for example from 0.5% to 30% by weight, relative to the weight of the at least one anhydrous composition (A). The at least one anhydrous composition (A) may also comprise various adjuvants conventionally used in hair dye compositions, such as anionic, cationic, nonionic, amphoteric, and zwitterionic polymers, and mixtures thereof; mineral thickeners, and fillers such as clays or talc; organic thickeners with, for example, anionic, cationic, nonionic, and amphoteric polymeric associative thickeners; antioxidants; penetrants; sequestrants; fragrances; dispersants; film-forming agents; ceramides; preserving agents; and opacifiers. The above adjuvants may be present in an amount for each of them ranging, for example, from 0.01% to 20% by weight relative to the weight of the at least one anhydrous composition (A). According to at least one aspect of the present disclosure, the at least one anhydrous composition (A) comprises at least one silica, for example of hydrophobic nature, for instance fumed silicas. When present, the at least one silica is present in an amount ranging, for example, from 1% to 30% by weight relative to the weight of the at least one anhydrous composition (A). For example, the at least one anhydrous composition (A) may be in the form of a gel or a cream. As indicated previously, the process according to the present disclosure may be performed in the presence of at least one composition (B) comprising at least one oxidizing agent. For example, the at least one oxidizing agent may be chosen from hydrogen peroxide, urea peroxide, alkali metal bromates and ferricyanides, and peroxygenated salts, for instance alkali metal and alkaline-earth metal persulfates, perborates and percarbonates, and peracids, and precursors thereof. This at least one composition (B) may comprise, for example, hydrogen peroxide, such as an aqueous solution (aqueous hydrogen peroxide solution), the titre of which may range, for example, from 1 to 40 volumes, such as from 5 to 40 volumes. As a function of the desired degree of lightening, the at least one composition (B) may also comprise an oxidizing agent chosen, for example, from peroxygenated salts. Alternatively, in at least one embodiment, the at least one oxidizing agent may not be chosen from peroxygenated salts, peracids, and precursors thereof. The at least one composition (B) may be aqueous or nonaqueous. As used herein, the term “aqueous composition” means a composition comprising more than 5% by weight of water, for example more than 10% by weight of water, such as more than 20% by weight of water. For example, the at least one composition (B) may be an aqueous composition. It may also comprise at least one organic solvent. Non-limiting examples of organic solvents that may be mentioned include linear or branched C2-C4 alkanols, such as ethanol and isopropanol; glycerol; polyols and polyol ethers, for instance 2-butoxyethanol, propylene glycol, dipropylene glycol, propylene glycol monomethyl ether, diethylene glycol monomethyl ether, and monoethyl ether, and also aromatic alcohols, for instance benzyl alcohol and phenoxyethanol, and mixtures thereof. When they are present, the at least one organic solvent is present in an amount ranging, for example, from 1% to 40% by weight, further for example from 5% to 30% by weight, relative to the weight of the at least one composition (B). The at least one composition (B) may comprise at least one acidifying agent. Non-limiting examples of the at least one acidifying agent include mineral and organic acids, for instance hydrochloric acid, orthophosphoric acid, sulfuric acid, carboxylic acids, for instance acetic acid, tartaric acid, citric acid, and lactic acid, and sulfonic acids. The pH of the at least one composition (B), when it is aqueous, may be less than 7. The at least one composition (B) may also comprise other ingredients conventionally used in the field, such as those detailed previously in the context of the at least one anhydrous composition (A). Further, the at least one composition (B) may be in various forms, for instance solutions, emulsions, and gels. The process according to the present disclosure is performed in the presence of at least one composition (C) comprising at least one dye chosen from oxidation dyes and direct dye. The oxidation dyes are generally chosen from at least one oxidation base optionally combined with at least one coupler. The at least one oxidation base may be chosen, by way of non-limiting example, from para-phenylenediamines, bis(phenyl)alkylenediamines, para-aminophenols, ortho-aminophenols, and heterocyclic bases, and the addition salts thereof. Among the para-phenylenediamines of which non-limiting mention may be made are, for example, para-phenylenediamine, para-tolylenediamine, 2-chloro-para-phenylenediamine, 2,3-dimethyl-para-phenylenediamine, 2,6-dimethyl-para-phenylenediamine, 2,6-diethyl-para-phenylenediamine, 2,5-dimethyl-para-phenylenediamine, N,N-dimethyl-para-phenylenediamine, N,N-diethyl-para-phenylenediamine, N,N-dipropyl-para-phenylenediamine, 4-amino-N,N-diethyl-3-methyl-aniline, N,N-bis(β-hydroxyethyl)-para-phenylenediamine, 4-N,N-bis(β-hydroxyethyl)amino-2-methylaniline, 4-N,N-bis(β-hydroxyethyl)amino-2-chloroaniline, 2-β-hydroxyethyl-para-phenylenediamine, 2-fluoro-para-phenylenediamine, 2-isopropyl-para-phenylenediamine, N-(β-hydroxypropyl)-para-phenylenediamine, 2-hydroxymethyl-para-phenylenediamine, N,N-dimethyl-3-methyl-para-phenylenediamine, N-ethyl-N-(β-hydroxyethyl)-para-phenylenediamine, N-(β,γ-dihydroxypropyl)-para-phenylenediamine, N-(4′-aminophenyl)-para-phenylenediamine, N-phenyl-para-phenylenediamine, 2-β-hydroxyethyloxy-para-phenylenediamine, 2-β-acetylaminoethyloxy-para-phenylenediamine, N-(β-methoxyethyl)-para-phenylenediamine, 4-aminophenylpyrrolidine, 2-thienyl-para-phenylenediamine, 2-β-hydroxyethylamino-5-aminotoluene, 3-hydroxy-1-(4′-aminophenyl)pyrrolidine, and the acid addition salts thereof. Non-limiting examples among the para-phenylenediamines mentioned above include, para-phenylenediamine, para-tolylenediamine, 2-isopropyl-para-phenyl-enediamine, 2-β-hydroxyethyl-para-phenylenediamine, 2-β-hydroxyethyloxy-para-phenylenediamine, 2,6-dimethyl-para-phenylenediamine, 2,6-diethyl-para-phenylenediamine, 2,3-dimethyl-para-phenylenediamine, N,N-bis(β-hydroxyethyl)-para-phenylenediamine, 2-chloro-para-phenylenediamine, and 2-β-acetylaminoethyloxy-para-phenylenediamine, and the acid addition salts thereof. Among the bis(phenyl)alkylenediamines of which non-limiting mention may be made are, for example, N,N′-bis(β-hydroxyethyl)-N,N′-bis(4′-aminophenyl)-1,3-diaminopropanol, N,N′-bis(β-hydroxyethyl)-N,N′-bis(4′-aminophenyl)ethylenediamine, N,N′-bis(4-aminophenyl)tetramethylenediamine, N,N′-bis(β-hydroxyethyl)-N,N′-bis(4-aminophen-yl)tetramethylenediamine, N,N′-bis(4-methylaminophenyl)tetramethylenediamine, N,N′-bis(ethyl)-N,N′-bis(4′-amino-3′-methylphenyl)ethylenediamine, 1,8-bis(2,5-diamino-phenoxy)-3,6-dioxaoctane, and the addition salts thereof. Among the para-aminophenols of which non-limiting mention may be made are, for example, para-aminophenol, 4-amino-3-methylphenol, 4-amino-3-fluorophenol, 4-amino-3-chlorophenol, 4-amino-3-hydroxymethylphenol, 4-amino-2-methylphenol, 4-amino-2-hydroxymethylphenol, 4-amino-2-methoxymethylphenol, 4-amino-2-aminomethylphenol, 4-amino-2-(β-hydroxyethylaminomethyl)phenol, 4-amino-2-fluorophenol, and the acid addition salts thereof. Among the ortho-aminophenols of which non-limiting mention may be made are, for example, 2-aminophenol, 2-amino-5-methylphenol, 2-amino-6-methylphenol, 5-acetamido-2-aminophenol, and the addition salts thereof. Among the heterocyclic bases of which non-limiting mention may be made are, for example, pyridine derivatives, pyrimidine derivatives, and pyrazole derivatives. Among the pyridine derivatives of which non-limiting mention may be made are the compounds described, for example, in Great Britain Patent Nos. GB 1 026 978 and GB 1 153 196, for instance 2,5-diaminopyridine, 2-(4-methoxyphenyl)amino-3-amino-pyridine, 3,4-diaminopyridine, and the addition salts thereof. Other pyridine oxidation bases that may be used in the present disclosure are, for example, the 3-aminopyrazolo[1,5-a]pyridine oxidation bases and addition salts thereof described, for example, in French Patent Application No. FR 2 801 308. Non-limiting examples that may be mentioned include pyrazolo[1,5-a]pyrid-3-ylamine, 2-acetylaminopyrazolo[1,5-a]pyrid-3-yl amine, 2-morpholin-4-ylpyrazolo[1,5-a]pyrid-3-ylamine, 3-aminopyrazolo[1,5-a]pyridine-2-carboxylic acid, 2-methoxypyrazolo[1,5-a]pyrid-3-ylamine, (3-aminopyrazolo[1,5-a]pyrid-7-yl)methanol, 2-(3-aminopyrazolo[1,5-a]pyrid-5-yl)ethanol, 2-(3-aminopyrazolo[1,5-a]pyrid-7-yl)ethanol, (3-aminopyrazolo[1,5-a]pyrid-2-yl)methanol, 3,6-diaminopyrazolo[1,5-a]pyridine, 3,4-diaminopyrazolo[1,5-a]pyridine, pyrazolo[1,5-a]pyridine-3,7-diamine, 7-morpholin-4-ylpyrazolo[1,5-a]pyrid-3-ylamine, pyrazolo[1,5-a]pyridine-3,5-diamine, 5-morpholin-4-ylpyrazolo[1,5-a]pyrid-3-ylamine, 2-[(3-aminopyrazolo[1,5-a]pyrid-5-yl)(2-hydroxyethyl)amino]ethanol, 2-[(3-aminopyrazolo[1,5-a]pyrid-7-yl)(2-hydroxyethyl)amino]ethanol, 3-aminopyrazolo[1,5-a]pyridin-5-ol, 3-amino-pyrazolo[1,5-a]pyridin-4-ol, 3-aminopyrazolo[1,5-a]pyridin-6-ol, 3-aminopyrazolo[1,5-a]pyridin-7-ol, and the addition salts thereof. Among the pyrimidine derivatives of which non-limiting mention may be made are the compounds described, for example, in Patent Publication Nos. DE 2 359 399; JP 88-169 571; JP 05-63124; EP 0 770 375; and WO 96/15765, for instance 2,4,5,6-tetraminopyrimidine, 4-hydroxy-2,5,6-triaminopyrimidine, 2-hydroxy-4,5,6-triaminopyrimidine, 2,4-dihydroxy-5,6-diaminopyrimidine, 2,5,6-triaminopyrimidine, and the addition salts thereof, and the tautomeric forms thereof, when a tautomeric equilibrium exists. Among the pyrazole derivatives of which non-limiting mention may be made are the compounds described, for example, in Patent Publication Nos. DE 3 843 892; DE 4 133 957; WO 94/08969; WO 94/08970; FR-A-2 733 749; and DE 195 43 988, for instance 4,5-diamino-1-methylpyrazole, 4,5-diamino-1-(β-hydroxyethyl)pyrazole, 3,4-diaminopyrazole, 4,5-diamino-1-(4′-chlorobenzyl)pyrazole, 4,5-diamino-1,3-dimethyl-pyrazole, 4,5-diamino-3-methyl-1-phenylpyrazole, 4,5-diamino-1-methyl-3-phenylpyrazole, 4-amino-1,3-dimethyl-5-hydrazinopyrazole, 1-benzyl-4,5-diamino-3-methylpyrazole, 4,5-diamino-3-tert-butyl-1-methylpyrazole, 4,5-diamino-1-tert-butyl-3-methylpyrazole, 4,5-diamino-1-(β-hydroxyethyl)-3-methylpyrazole, 4,5-diamino-1-ethyl-3-methylpyrazole, 4,5-diamino-1-ethyl-3-(4′-methoxyphenyl)pyrazole, 4,5-diamino-1-ethyl-3-hydroxymethylpyrazole, 4,5-diamino-3-hydroxymethyl-1-methylpyrazole, 4,5-diamino-3-hydroxymethyl-1-isopropylpyrazole, 4,5-diamino-3-methyl-1-isopropylpyrazole, 4-amino-5-(2′-aminoethyl)-amino-1,3-dimethylpyrazole, 3,4,5-triaminopyrazole, 1-methyl-3,4,5-triaminopyrazole, 3,5-diamino-1-methyl-4-methylaminopyrazole, 3,5-diamino-4-(β-hydroxyethyl)amino-1-methylpyrazole, and the addition salts thereof. 4,5-Diamino-1-(β-methoxyethyl)pyrazole may also be used. A heterocyclic base that may also be used is 2,3-diamino-6,7-dihydro-1H,5H-pyrazolo[1,2-a]pyrazol-1-one, or a salt thereof. The at least one composition (C) according to the present disclosure may optionally comprise at least one coupler chosen from those conventionally used in the dyeing of keratin fibers. 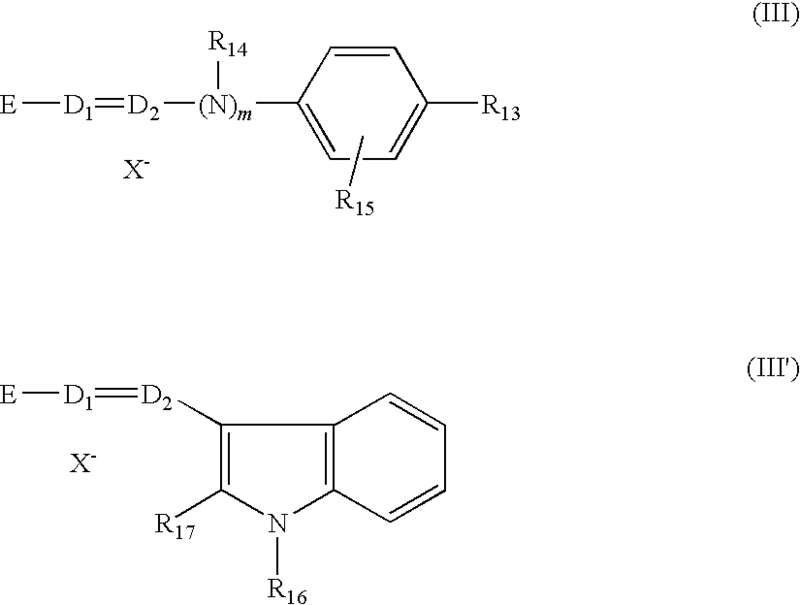 Among these couplers, non-limiting mention may be made, for example, of meta-phenylenediamines, meta-aminophenols, meta-diphenols, naphthalene-based couplers, heterocyclic couplers, and the addition salts thereof. Non-limiting mention may be made, for example, of 1,3-dihydroxybenzene, 1,3-dihydroxy-2-methylbenzene, 4-chloro-1,3-dihydroxybenzene, 2,4-diamino-1-(β-hydroxyethyl oxy)benzene, 2-amino-4-(β-hydroxyethylamino) 1-methoxybenzene, 1,3-diaminobenzene, 1,3-bis(2,4-diaminophenoxy)propane, 3-ureidoaniline, 3-ureido-1-dimethylaminobenzene, sesamol, 1-β-hydroxyethylamino-3,4-methylenedioxybenzene, α-naphthol, 2-methyl-1-naphthol, 6-hydroxyindole, 4-hydroxyindole, 4-hydroxy-N-methyl-indole, 2-amino-3-hydroxypyridine, 6-hydroxybenzomorpholine, 3,5-diamino-2,6-dimethoxypyridine, 1-N-(β-hydroxyethyl)amino-3,4-methylenedioxybenzene, 2,6-bis(β-hydroxyethylamino)toluene, 6-hydroxyindoline, 2,6-dihydroxy-4-methylpyridine, 1-H-3-methylpyrazo-5-one, 1-phenyl-3-methylpyrazol-5-one, 2,6-dimethylpyrazolo[1,5-b]-1,2,4-triazole, 2,6-dimethyl[3,2-c]-1,2,4-triazole, 6-methylpyrazolo[1,5-a]benzimidazole, the acid addition salts thereof, and mixtures thereof. For example, the addition salts of the at least one oxidation base and at least one coupler that may be used in the context of the present disclosure are chosen, for example, from the acid addition salts such as the hydrochlorides, hydrobromides, sulfates, citrates, succinates, tartrates, lactates, tosylates, benzenesulfonates, phosphates, and acetates. The at least one oxidation base may be present in an amount ranging from 0.0001% to 10% by weight relative to the total weight of the composition, for example from 0.005% to 5% by weight relative to the total weight of the composition. The at least one coupler, when present, may be present in an amount ranging from 0.0001% to 10% by weight relative to the total weight of the composition, for example from 0.005% to 5% by weight relative to the total weight of the composition. As regards the direct dyes, these dyes may be chosen, for example, from ionic and nonionic species, for instance cationic or nonionic species. Non-limiting examples of suitable direct dyes that may be mentioned include azo; methine; carbonyl; azine; nitro (hetero)aryl; tri(hetero)arylmethane; porphyrin; phthalocyanin direct dyes, and natural direct dyes, alone or as mixtures. For instance, the azo dyes may comprise an —N═N— function, the two nitrogen atoms of which are not simultaneously engaged in a ring. However, one of the two nitrogen atoms of the sequence —N═N— may be engaged in a ring as well. The dyes of the methine family are, for example, compounds comprising at least one sequence chosen from >C═C< and —N═C<, the two atoms of which are not simultaneously engaged in a ring. However, one of the nitrogen or carbon atoms of the sequences may be engaged in a ring as well. For example, the dyes of this family are derived from compounds of the type such as methines, azomethines, mono- and diarylmethanes, indoamines (or diphenylamines), indophenols, indoanilines, carbocyanins, azacarbocyanins, and isomers thereof, diazacarbocyanins, and isomers thereof, tetraazacarbocyanins, and hemicyanins. As regards the dyes of the carbonyl family, non-limiting mention may be made of acridone, benzoquinone, anthraquinone, naphthoquinone, benzanthrone, anthranthrone, pyranthrone, pyrazolanthrone, pyrimidinoanthrone, flavanthrone, idanthrone, flavone, (iso)violanthrone, isoindolinone, benzimidazolone, isoquinolinone, anthrapyridone, pyrazoloquinazolone, perinone, quinacridone, quinophthalone, indigoid, thioindigo, naphthalimide, anthrapyrimidine, diketopyrrolopyrrole, and coumarin. As regards the dyes of the cyclic azine family, non-limiting mention may be made of azine, xanthene, thioxanthene, fluorindine, acridine, oxazine, dioxazine, thiazine, dithiazine, and pyronin. The nitro (hetero) aromatic dyes may be, for example, nitrobenzene or nitropyridine direct dyes. As regards the dyes of porphyrin or phthalocyanin type, it is possible to use cationic or noncationic compounds, optionally comprising at least one metal or metal ion, for instance alkali metals, alkaline-earth metals, zinc, and silicon. Non-limiting examples of suitable direct dyes that may be mentioned include, for example, nitrobenzene dyes; azo direct dyes; azomethine direct dyes; methine direct dyes; azacarbocyanin direct dyes, for instance tetraazacarbocyanins (tetraazapentamethines); quinone and, for example, anthraquinone, naphthoquinone, and benzoquinone direct dyes; azine; xanthene; triarylmethane; indoamine; indigoid; phthalocyanin direct dyes, porphyrins, and natural direct dyes, alone or as mixtures. These dyes may be monochromophoric dyes which means comprising only one dye group, or polychromophoric, for example di- or trichromophoric; the chromophores possibly being identical or different, and from the same chemical family or otherwise. A polychromophoric dye comprises several radicals each derived from a molecule that absorbs in the visible region ranging from 400 to 800 nm. Furthermore, this absorbance of the dye generally does not involve any prior oxidation thereof, or combination with any other chemical species. In the case of polychromophoric dyes, the chromophores may be connected together by means of at least one linker, which may be cationic or noncationic. For example, the linker may be chosen from linear, branched and cyclic C1-C20 alkyl chains, optionally interrupted with at least one heteroatom, such as nitrogen and oxygen, and/or with at least one group comprising such an atom, such as CO and SO2, optionally interrupted with at least one heterocycle that may or may not be fused to a phenyl nucleus and comprising at least one quaternized nitrogen engaged in the ring and optionally at least one other heteroatom, such as oxygen, nitrogen, and sulfur, optionally interrupted with at least one substituted or unsubstituted phenyl and naphthyl group, optionally at least one quaternary ammonium group substituted with two optionally substituted C1-C15 alkyl groups; the linker not comprising any nitro, nitroso, and peroxy groups. If the heterocycles or aromatic nuclei are substituted, they are substituted, by way of non-limiting example, with at least one C1-C8 alkyl radical optionally substituted with hydroxyl, C1-C2 alkoxy, C2-C4 hydroxyalkoxy, acetylamino, and amino groups substituted with at least one C1-C4 alkyl radical, optionally bearing at least one hydroxyl group, and/or the two radicals possibly forming, with the nitrogen to which they are attached, a 5- or 6-membered heterocycle optionally comprising another heteroatom identical to or different, chosen from nitrogen atoms; halogens; hydroxyl groups; C1-C2 alkoxy radicals; C2-C4 hydroxyalkoxy radicals; amino radicals; amino radicals substituted with at least one identical or different C1-C4 alkyl radicals optionally bearing at least one hydroxyl group. 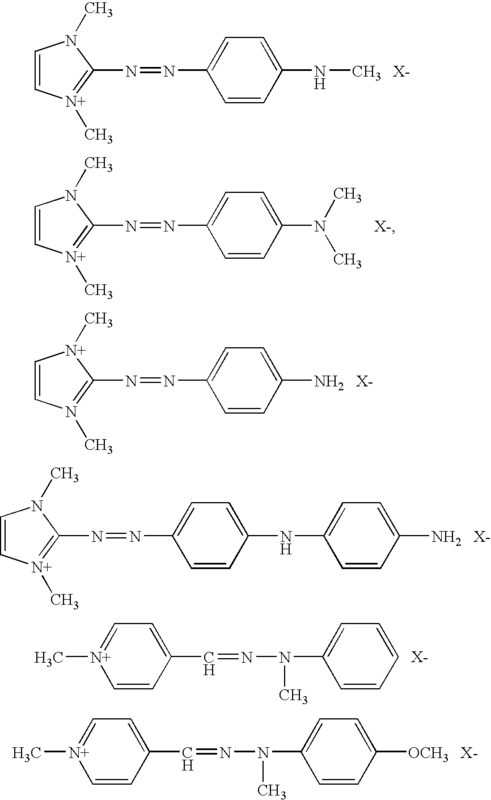 Among the azo, azomethine, methine, and tetraazapentamethine direct dyes that may be used according to the present disclosure, non-limiting mention may be made of the cationic dyes described in Patent Publication Nos. WO 95/15144; WO 95/01772; EP 714 954; FR 2 189 006, FR 2 285 851; FR 2 140 205; EP 1 378 544; and EP 1 674 073.
wherein R′ is a C1-C4 alkyl radical. n=0 or 1, with, when n is 1, U is a —CO— radical. In structures (I) to (IV) defined above, the C1-C4 alkyl or alkoxy group, by way of non-limiting example, may be chosen from methyl, ethyl, butyl, methoxy, and ethoxy. Non-limiting mention may also be made of 1-(4′-aminodiphenylazo)-2-methyl-4-bis(β-hydroxyethyl)aminobenzene. X− is an anion chosen, for example, from chloride, iodide, methyl sulfate, ethyl sulfate, acetate, and perchlorate. Among the polychromophoric dyes, non-limiting mention may be made of symmetrical or nonsymmetrical azo and/or azomethine (hydrazone) di- or trichromophoric dyes comprising for example at least one optionally fused 5- or 6-membered aromatic heterocycle, comprising at least one quaternized nitrogen atom engaged in the heterocycle and optionally at least one other heteroatom, such as nitrogen, sulfur, and oxygen, and, in another example, at least one optionally substituted phenyl or naphthyl group, optionally bearing at least one group OR with R being chosen from a hydrogen atom, an optionally substituted C1-C6 alkyl radical, an optionally substituted phenyl nucleus, and at least one group N(R′)2 with R′, which may be identical or different, chosen from a hydrogen atom, an optionally substituted C1-C6 alkyl radical and an optionally substituted phenyl nucleus; the radicals R′ possibly forming, with the nitrogen atom to which they are attached, a saturated 5- or 6-membered heterocycle, or alternatively one and/or both the radicals R′ may each form, with the carbon atom of the aromatic ring located ortho to the nitrogen atom, a saturated 5- or 6-membered heterocycle. Aromatic cationic heterocycles of which non-limiting mention may be made include 5- or 6-membered rings comprising 1 to 3 nitrogen atoms, for example, 1 to 2 nitrogen atoms, one being quaternized; the heterocycle moreover being optionally fused to a benzene nucleus. The heterocycle may optionally comprise another heteroatom other than nitrogen, for instance sulfur or oxygen. If the heterocycles or phenyl or naphthyl groups are substituted, they are substituted, for example, with at least one C1-C8 alkyl radical optionally substituted with a hydroxyl, C1-C2 alkoxy, C2-C4 hydroxyalkoxy, acetylamino or amino group substituted with one or two C1-C4 alkyl radicals optionally bearing at least one hydroxyl group, or the two radicals possibly forming, with the nitrogen atom to which they are attached, a 5- or 6-membered heterocycle, optionally comprising another heteroatom identical to or different than nitrogen; a halogen atom; a hydroxyl group; a C1-C2 alkoxy radical; a C2-C4 hydroxyalkoxy radical; an amino radical; an amino radical substituted with one or two identical or different C1-C4 alkyl radicals, optionally bearing at least one hydroxyl group. These polychromophores are connected together via at least one linker optionally comprising at least one quaternized nitrogen atom optionally engaged in a saturated or unsaturated, optionally aromatic heterocycle. For example, the linker may be a linear, branched or cyclic C1-C20 alkyl chain, optionally interrupted with at least one heteroatom (such as nitrogen or oxygen) and/or with at least one group comprising such a heteroatom (CO or SO2), optionally interrupted with at least one heterocycle optionally fused to a phenyl nucleus and comprising at least one quaternized nitrogen atom engaged in the ring and optionally at least one other heteroatom (such as oxygen, nitrogen, or sulfur), optionally interrupted with at least one substituted or unsubstituted phenyl or naphthyl group, optionally at least one quaternary ammonium group substituted with two optionally substituted C1-C15 alkyl groups; the linker not comprising any nitro, nitroso, or peroxy groups. The bonding between the linker and each chromophore may, for example, take place via a heteroatom substituent on the phenyl or naphthyl nucleus or via the quaternized nitrogen atom of the cationic heterocycle. The at least one dye may comprise identical or different chromophores. As examples of such dyes, non-limiting reference may be made to Patent Publication Nos. EP 1 637 566, EP 1 619 221, EP 1 634 926, EP 1 619 220, EP 1 672 033, EP 1 671 954, EP 1 671 955, EP 1 679 312, EP 1 671 951, EP 167 952, EP 167 971, WO 06/063 866, WO 06/063 867, WO 06/063 868, WO 06/063 869, EP 1 408 919, EP 1 377 264, EP 1 377 262, EP 1 377 261, EP 1 377 263, EP 1 399 425, EP 1 399 117, EP 1 416 909, EP 1 399 116, and EP 1 671 560. It is also possible to use the cationic direct dyes mentioned in, for example, European Patent Application No. : EP 1 006 153, which describes dyes comprising two chromophores of anthraquinone type connected via a linker of cationic type; European Patent Application Nos. EP 1 433 472, EP 1 433 474, EP 1 433 471, and EP 1 433 473, which describe identical or different dichromophoric dyes, connected via a cationic or noncationic linker, and also European Patent Application No. EP 6 291 333, which describes dyes comprising three chromophores, one of them being an anthraquinone chromophore, to which are attached two chromophores of azo or diazacarbocyanin type or an isomer thereof. Among the natural direct dyes that may be used according to the present disclosure, non-limiting mention may be made of lawsone, juglone, alizarin, purpurin, carminic acid, kermesic acid, purpurogallin, protocatechaldehyde, indigo, isatin, curcumin, spinulosin, apigenidin, and orceins. It is also possible to use extracts or decoctions comprising these natural dyes, for example, henna-based poultices or extracts. When they are present, the at least one direct dye is present in an amount ranging, for example, from 0.0001% to 10% by weight, further for example from 0.005% to 5% by weight, relative to the total weight of the composition. The at least one composition (C) comprises at least one dye chosen from oxidation dyes and direct dyes. It may optionally comprise two dye compositions, one comprising the at least one oxidation dye, the other the at least one direct dye. The at least one composition (C) may be an anhydrous or aqueous composition. For example, the at least one composition (C) comprises at least water and optionally another solvent. Those that were mentioned in the context of the description of the at least one composition (B) may, by way of non-limiting example, be used for the at least one composition (C), at the concentrations also specified for the at least one composition (B). The at least one composition (C) may also comprise at least one organic amine having a pKb less than 12 at 25° C. Those which have been described previously may also be used in composition (C). If the at least one composition (C) comprises at least one organic amine, then the total amount of organic amine present in the at least one anhydrous composition (A) and the at least one composition (C) is present in an amount ranging, for example, from 0.1% to 40% by weight, further for example from 0.5% to 20% by weight, relative to the weight of the compositions. The at least one composition (C) may also comprise standard additives such as those that have been listed previously, and reference may be made thereto. The pH of the at least one composition (C) ranges from 2 to 12, for example from 3 to 11. The pH may be adapted using acidifying or basifying agents, such as those mentioned previously. According to at least one aspect of the present disclosure, compositions (A), (B), and (C) are applied to wet or dry keratin fibers, successively and without intermediate rinsing, for example, compositions (A) and (B), or (B) and (A) are applied, followed by the at least one composition (C). In accordance with another aspect of the process, a composition obtained by extemporaneous mixing, before application, of compositions (A), (B), and (C) is applied to the wet or dry keratin fibers. In these embodiments, the value of the weight ratio R1 of the amounts of compositions ((A)+(C))/(B) and the value of the weight ratio R2 of the amounts of compositions (A)/(C) range from 0.1 to 10, for example from 0.3 to 3. According to one aspect of the present disclosure, the at least one composition (B) is present in an amount ranging from 50% to 70% of the total weight of the mixture of compositions (A), (B), and (C) to be applied to the hair. The mixture present on the fibers (resulting either from the extemporaneous mixing of compositions (A), (B), and (C) or from the successive application of these compositions) is left on the fibers for a period of time sufficient for dyeing the fibers. For example, the period of time may range from 1 minute to 1 hours for example from 5 minutes to 30 minutes. If the composition applied to the hair (comprising compositions (A), (B), and (C)) comprises aqueous ammonia, then the aqueous ammonia may be present in an amount, for example, less than or equal to 0.03% by weight relative to the final composition (expressed as NH3), for example less than or equal to 0.01% by weight relative to the final composition. The final composition results from the mixing of compositions (A), (B), and (C); these mixtures being prepared before application to the keratin fibers (extemporaneous preparation) or directly on the keratin fibers (successive applications with or without premixing and without intermediate rinsing). In at least one embodiment of the present disclosure, compositions (A), (B), and (C) do not comprise aqueous ammonia. Another aspect of the present disclosure relates to a ready-to-use composition for dyeing human keratin fibers, comprising at least 35% by weight of at least one fatty substance, at least one organic amine having a pKb less than 12 at 25° C., at least one surfactant, at least one dye chosen from oxidation dyes and direct dyes, and at least one oxidizing agent. Everything that has been detailed previously in the context of compositions (A), (B), and (C), with regard to the above ingredients, remains valid and reference may be made thereto. Another aspect of the present disclosure relates to a multi-compartment device or kit comprising, in at least one first compartment, at least one anhydrous composition (A), in at least one second compartment, at least one composition (B) comprising at least one oxidizing agent, and in at least one third compartment, at least one composition (C) comprising at least one dye chosen from oxidation dyes and direct dyes. 10 parts by weight of an aqueous oxidizing composition comprising 6% of hydrogen peroxide at pH 2.3 and comprising about 80% water (B). The resulting mixture, having a pH of 10, was then applied to a lock of natural hair containing 90% white hairs (NW) and to a permanent-waved NW lock (PWW). After this time, the locks were rinsed, and then washed with an Elsève multivitamin shampoo. No unpleasant odor was observed, either during the preparation of the dye mixture, or during the leave-on time on the locks. The color of the hair was determined by using the L*a*b* system, with a MINOLTA CM2002® spectrophotometer. According to this system, L* indicates the lightness. The lower the value of L*, the more intense is the color of the hair. The chromaticity coordinates are expressed by the parameters a* and b*, a* indicating the axis of red/green shades and b* the axis of yellow/blue shades. The selectivity of the coloration is the variation of the color between natural colored hair and permed colored hair. Natural hair is representative of the nature of the hair at the root, and the permed hair is representative of the nature of the hair at the tip. wherein L* indicates lightness and a* and b* are the chromaticity coordinates of the natural colored locks whereas L0* indicates the lightness and a0* and b0* are the chromaticity of the permed colored locks. A lower value of ΔE indicates lower selectivity of the coloration and more uniform color along the hair from the tip to the roots. As shown by the results below, a strong, matt, sparingly selective coloration was obtained. leaving the compositions on the fibers for a period of time sufficient to dye the fibers. 4. The process according to claim 1, wherein the at least one fatty substance is present in an amount ranging from 10% to 99% by weight relative to the weight of the at least one anhydrous composition (A). 5. The process according to claim 1, wherein the at least one organic amine is at least partially miscible in the at least one fatty substance. 6. The process according claim 1, wherein the at least one organic amine comprises one or two functional groups chosen from primary, secondary, and tertiary amine functional groups, and at least one group chosen from linear and branched C1-C8 alkyl groups bearing at least one hydroxyl radical. 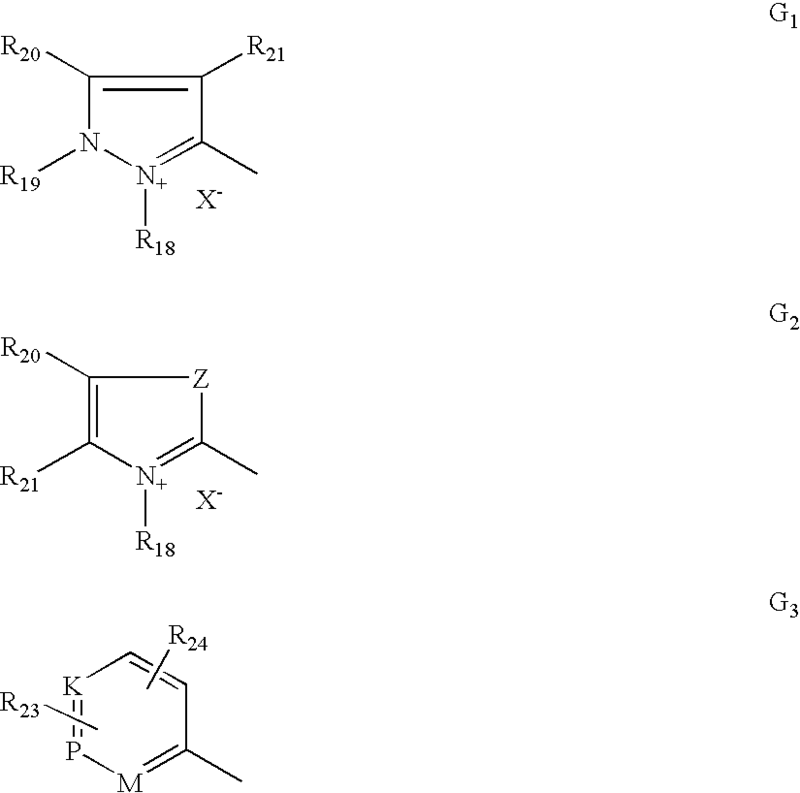 wherein W is chosen from C1-C6 alkylene residues optionally substituted with a hydroxyl group; Rx, Ry, Rz, and Rt, which may be identical or different, are chosen from a hydrogen atom, and C1-C6 alkyl, C1-C6 hydroxyalkyl, and C1-C6 aminoalkyl radicals. 9. The process according to claim 8, wherein the at least one organic amine is chosen from 2-amino-2-methyl-1-propanol and monoethanolamine. 11. The process according to claim 1, wherein the at least one organic amine is chosen from arginine, histidine, and lysine. 12. The process according to claim 1, wherein the at least one organic amine is present in an amount ranging from 0.1% to 40% by weight relative to the weight of the at least one anhydrous composition (A). 13. The process according to claim 12, wherein the at least one organic amine is present in an amount ranging from 0.5% to 20% by weight relative to the weight of the at least one anhydrous composition (A). 14. The process according to claim 1, wherein the at least one surfactant is a nonionic surfactant chosen from monooxyalkylenated, polyoxyalkylenated, monoglycerol-ated, and polyglycerolated nonionic surfactants. 15. The process according to claim 1, wherein the at least one surfactant is present in an amount ranging from 0.1% to 50% by weight relative to the weight of the at least one anhydrous composition (A). 16. The process according to claim 15, wherein the at least one surfactant is present in an amount ranging from 0.5% to 30% by weight relative to the weight of the at least one anhydrous composition (A). 17. The process according to claim 1, wherein the at least one composition (C) further comprises at least one organic amine having a pKb less than 12 at 25° C.
18. The process according to claim 1, wherein the compositions (A), (B), and (C) are applied to the keratin fibers successively and without intermediate rinsing. 19. The process according to claim 1, wherein the compositions (B), (A), and (C) are applied to the keratin fibers successively and without intermediate rinsing. 20. The process according to claims 1, wherein a composition obtained by extemporaneous mixing, before application, of compositions (A), (B), and (C) is applied to the keratin fibers. 21. The process according to claim 1, wherein the value of the weight ratio R1 of the amounts of compositions ((A)+(C))/(B), and the value of the weight ratio R2 of the amounts of compositions (A)/(C), ranges from 0.1 to 10. 22. The process according to claim 21, wherein the value of the weight ratio R1 of the amounts of compositions ((A)+(C))/(B) and the value of the weight ratio R2 of the amounts of compositions (A)/(C), ranges from 0.3 to 3. 23. The process according to claim 1, wherein the at least one composition (B) is present in an amount ranging from 50% to 70% of the total weight of the mixture of compositions (A), (B), and (C). 24. The process according to claim 1, wherein the compositions (A), (B), and (C), combined on the fibers comprises at least 35% by weight of at least one fatty substance. at least one third compartment containing at least one composition (C) comprising at least one dye chosen from oxidation dyes and direct dyes. 26. A ready-to-use composition for dyeing human keratin fibers, comprising at least 35% by weight of at least one fatty substance, at least one organic amine having a pKb less than 12 at 25° C., at least one surfactant, at least one dye chosen from oxidation dyes and direct dye, and at least one oxidizing agent. US647552A (en) * 1899-02-25 1900-04-17 Charles H Bennett Furnace, stove, or fireplace.